Join us for Opening Night on February 15th between 6-9pm. Meet the artists, enjoy light refreshments, and find joy in one another. It’s free and open to all! Tables can be divisive, painful reminders of our exclusion. We can feel lonely as we sit at the outskirts of the table, seeing no one else like us, no one willing to listen. But the table is also a site for radical change, of positive connection, and of shared power. Yellow House realizes that this is not a finished story and expands the table with new artists and themes as (Re)Set the Table reconvenes with artists of different identities and backgrounds who invite us to their table. We view the world from a woman who cannot see and artists whose migration makes them invisible in new communities; from black women whose struggles persist across generations and men whose countries reject them. We are invited to a table built by a group of women who reset the table with love—love for one’s community, for one’s art, and most importantly, for one another and one’s self. (Re)Set the Table engages us to be persistent, creative, dedicated, and tenacious. The exhibition continues to ask visitors to reflect on their own narratives and the lived experiences of others by asking: Who sits at these tables? Who doesn’t and why not? How do individuals and communities create their own spaces for connecting, learning, supporting, and leading? What role do we each play in resetting the table? 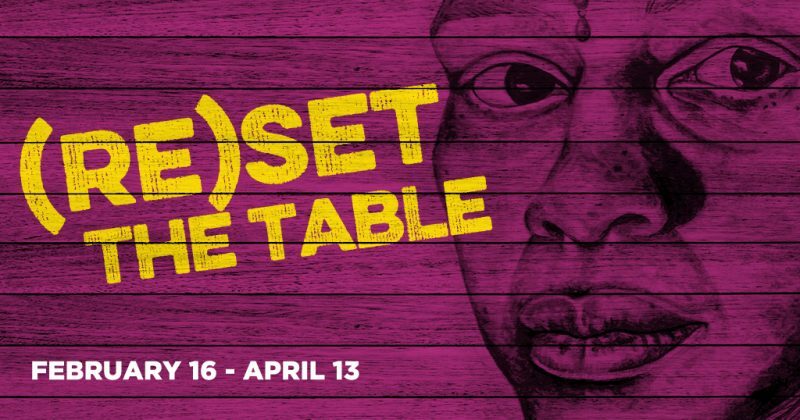 (Re)Set the Table is interactive, creating emotional connections and shaping community as inclusive. When you leave, you will take something with you from the table…an experience, additional knowledge, a better understanding of yourself.